After the success of the first day and the sprint event, day two at the Sandman Triathlon powered by Suunto was met with excitement and anticipation by the hundreds of triathletes who descended on Newborough, Anglesey to take part in the full distance triathlon billed as the "UK's no.1 triathlon location". The triathletes were met with beautiful views of Llanddwyn beach as they racked and prepared for their epic triathlon race! Saturday had seen over 350 triathletes embark on the Sandman Triathlon Sprint event. The first day also included the brilliant Sandman Triathlon Junior race where over 100 youths participated. After 1000m of swimming, 60km on the bike and closing with a beautiful 10km trail run, it was Ewan Brown, who for the second year running emerged victorious in Sunday's men's race with an incredible time of 2:24:40. Brown beat Alex Foster who finished in second place and Paul Hawkins, who finished third. It was a different story in the women's race as reigning Always Aim High Tri Series and Sandman Triathlon champion Suzie Richards competed in the team relay race due to an injury. This opened the door for Natalie Seymour who was in second place in the AAH Tri Series leaderboard going into the race. Exiting T1 in second place after a strong swim time Seymour looked to stamp her authority on the race. 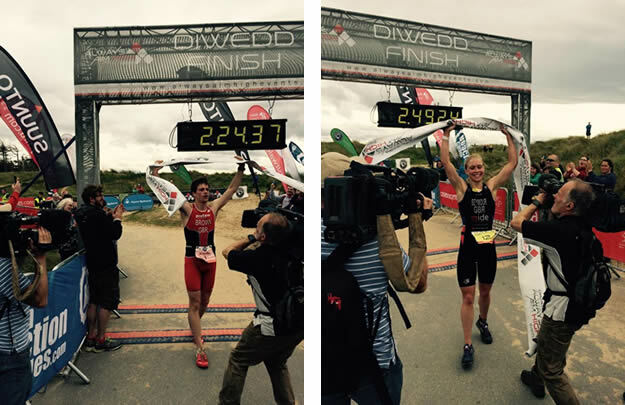 After an incredible bike leg and an unbelievable trail run Seymour was subsequently crowned 2015 Sandman Triathlon champion beating Helen Talbot into second place and Dorothy Liviabella into third. With thousands of enthusiastic supporters cheering on the triathletes the atmosphere at Llanddwyn was electric. Emerging out of the water, defending Sandman and Always Aim Tri-Series champion Ewan Brown eased into the top-10 as the leaders exited T1. However, as they returned into Newborough following the challenging 60km bike leg it was clear that it would be difficult for anyone to challenge Brown, as he started the run in first place, a clear one minute and 24 seconds in front of nearest challenger Foster. Brown then extended his lead over the tenacious Foster with a great trail run time. Brown eventually ran out Sandman winner with well over three minutes to spare. On Saturday Greg Cherry and Helen Talbot emerged as individual winners of the men and women Sandman Tri Sprint, after storming around the course in a time of 1:09:21 and 1:21:41 respectively. The sprint in Llanddwyn consisted a 400m open-sea swim, a 30km bike leg through iconic Anglesey villages and a scenic, but challenging, 5km trail run through Newborough forest and up the unforgiving sand dunes. Cherry, the 30 year-old representing Tri Camp TFN Race was jubilant at the finish line and was full of praise of the event and the event organisers. Second place went to Andrew Nash, with local man Phil Lynes claiming third. In the women's race as Helen Talbot, who also finished second in the Sandman full distance emerged victorious. A dominant display saw Talbot claim first place with Jasmine Bowyer and Alex Aldous finishing second and third respectively. The fifth instalment of the famous Sandman Triathlon saw the introduction of the Sandman Savage. The Savage saw competitors compete over two days in the Sprint and the Full distance races. The winner of the Sandman Savage in the male category was Greg Cherry producing an extraordinary time of 03:55:28. The winner of the Savage in the women's category was Helen Talbot completed the challenge in 4:22:47. "What a brilliant weekend we've had! The Sandman was one of the first ever events AAHE organised. In the first year we had around 300 athletes participating, so to see over 900 athletes come to Anglesey over two days is something to be really proud of. It's incredible to see how much the event has grown in such a short amount of time. "The race action across the weekend was superb. All the winners were worthy of their titles. I want to reserve special congratulations to Ewan and Natalie who were crowned Sandman Tri champions. Ewan and Natalie are now in the driving seat to be crowned the Always Aim Tri-series, which will see the champion fly to the beautiful Carribean Island of Nevis and compete in the Nevis Triathlon. With only the Snowman Triathlon left it's going to take something special for someone to catch them. It was fantastic to see so many juniors participating in the Sandman junior races. We are delighted to be able to offer juniors an opportunity to be able to race in front of a big crowd; hopefully it will act as a platform for future triathletes! I want to say thank you to Roger Pierce and his crew for their support." "We are very grateful to Suunto for their support as well as our other partners Chain Reaction Cycles, Visit Wales, Anglesey County Council, Natural Resources Wales, Nevis Triathlon, Kinetica, AquaSphere, The Pentraeth Group, Salomon, Amphibia, Superfeet, Jones o Gymru and Kon-X"
"I would also like to say a huge congratulations and thank you from all at AAHE to everyone who took part in the sprint and full tri events. Having talked to entrants of the weekend it looks like we have welcomed hundreds of first time triathletes to the Sandman, we are so pleased to be in a position to do that. 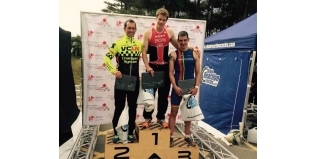 The sprint race is a great opportunity for anyone who is looking to get into Triathlon." The Sandman is the second triathlon in the Always Aim High Tri-Series, which also includes the excellent Slateman (May) and Snowman Tri (September 26th and 27th).